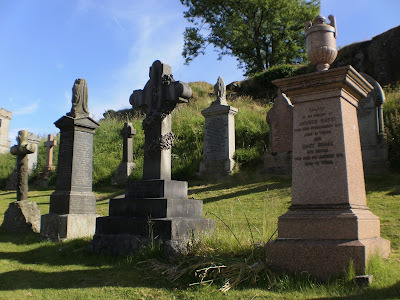 This is another article written a few years ago for the now dearly departed Discover my Past Scotland magazine, this time from July 2011 - enjoy! As much as with baptisms and marriages, Scottish funerals were surrounded heavily by tradition in the past. Today we tend to think of death as a private affair, and the subsequent funeral or cremation the occasion where close friends and family can say goodbye. In the past however, the death of a person in a parish was a much more public occasion, providing nothing short of a holiday for many. The deceased may in fact have already witnessed the mourners coming in for the occasion, his friends and families having been alerted in advance, and undoubtedly causing he or she additional suffering from the resultant disturbance. Between death and burial, a key fear was for the soul; windows would be opened to allow it to escape (and quickly closed to stop it coming back! ), mirrors were covered and clocks stopped, in order that the person’s soul would not be confused or distracted as it departed. To prevent food and whisky being ‘corrupted’, a piece of iron was driven in, such as a small nail. The women would then clean and ‘kistan’ the body (place it in a coffin), after which it would then be watched prior to the funeral in a ‘lyje-wake’ or ‘waukan’. This was sometimes a merry occasion and at other times sombre, where friends and relatives could convey their regards, and touch the body as a mark of respect. Furthermore, in the Highlands, ‘earth was laid upon the corpse’, a tradition whereby small amounts of earth and salt were placed on a wooden plate on the deceased’s chest, symbolising the corruptibility of the body and the incorruptibility of the soul. In his “Traditions of Perth” in 1832, author George Penny notes that when a person died in the burghs, the bellman would announce it around the town, reciting “Men and brethren, I let you to wit, that our brother, A. B., departed this life on Thursday last, and is to be interred on Sunday evening… when the company of all his brethren is expected”, long before newspaper intimations and funeral letters took on the same function. Following the death a merchant’s family would stop all trade until after the funeral, whilst on the day itself groups of ‘mourners’ would walk around the streets in a mob, an action which George Penny recalls in Perth as being merely ‘for the love of show’. The normal funeral tradition followed across most of the country, in both the burghs and the rural parishes, was to gather the mourners on the Sunday morning for prayers, although the burial itself would not happen until the afternoon or even the evening. In Dundonald, Ayrshire, the Old Statistical Account notes how every person attending was given a pipe and tobacco to help while away the hours until the burial began. The provision of hospitality to the guest was all part of providing the deceased with a ‘decent burial’, with whisky, oat bread and cheese laid on. Many a person’s greatest fear was death in poverty, with a burial in a pauper’s grave, and so great efforts were made to save in advance for the time of death, in order not to land a burden on the family. On many occasions an alternative way to pay for the occasion was to auction off the deceased’s procession afterwards at a ‘roup’. At times however, this hospitality could be taken to extremes, costing a small fortune and driving the minister to despair. In Gargunnock the minister noted in the 1790s that after a meal and a drink 'not a few return to the dirge, and sometimes forget what they have been doing, and where they are'. The dirge was the great feast after the burial, also known as a ‘dredgy’, though in places such as Campsie, the mourners were regularly plied with drams and shortbread before the burial through a custom known as a ‘service’. Penny recalls an amusing incident at the funeral of an elderly lady in Perth who had left a considerable fortune to two sons. After much drinking he notes the consequence. 'Some one hinted that it was time to proceed, as they had a considerable way to ride. Orders were accordingly given to get out the horses; the company mounted and set out, and proceeded a couple of miles towards the place of interment, before it was discovered that they had left the lady behind'! With the burial time approaching, the coffin would be lifted and carried to the burial plot, with the procession led by a person ringing the mort-bell, in an attempt to drive evil spirits away. The body or coffin itself was covered in a dark mortcloth, hired from the kirk for the payment of a fee known as ‘mort-money’, and many would show their respects by carrying it part of the way. In 1896 the minister of West Kilbride, the Reverend James Lamb, noted in his book 'Annals of an Ayrshire Parish' just how profitable the hiring out of a mortcloth could be for the kirk in the 1770s: '…three qualities were at one time kept, which were hired out at different dates at diverse rates. Thus, in 1771, the rates are five shillings for the best, and three shillings for the second; but these rates are afterwards raised to eight shillings for the best, and four shillings for the second, and three shillings for the third, in the case of an adult; and one shilling and eightpence and one shilling and tenpence for a child. In the case of a person of special wealth or importance, however, the Kirk Session knew how to apply the screw; in such instances we sometimes find ten shillings charged.' In the burghs, the guilds and incorporations often maintained their own mortcloth, which they would let out instead of the kirk. The poor were not charged, however, and children under the age of ten were usually buried without the use of one. For the wealthier a hearse would be employed, rather than the coffin carried, with the undertaker usually the local joiner operating in a dual role. At the kirk the women would go no further, returning home instead to prepare the dredgy, whilst the men attended to the burial. There were many traditions surrounding the graveyard itself. In Newburgh in Fife it was believed that if a person who had committed suicide was taken through the gate of the kirkyard, a child subsequently being presented through the gate for baptism would be cursed to end his or her days by the same fate. 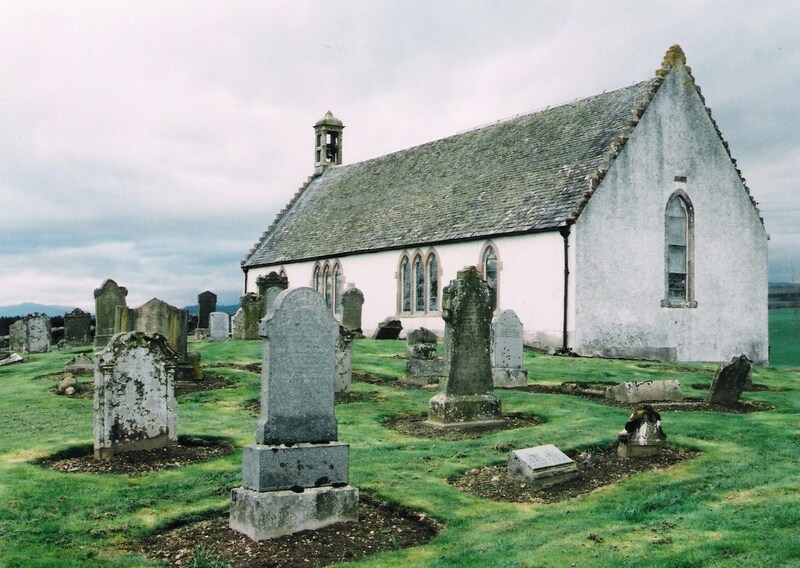 In Monquhitter, Aberdeenshire, there was a belief that the soul of the departed was not in fact quite so departed, it remaining behind to keep watch at the gate until its replacement arrived from the next funeral. This led to the frequent problem, as described in the First Statistical Account, whereby two funerals happening on the same day would often end in violence. If the two funeral parties met at the gate 'the dead were thrown down till the living decided by blows which ghost should be condemned to porter it'. Prior to the 19th century a great desire held by many was to be buried in the parish of their ancestors, rather than in the village or town where they later came to reside. 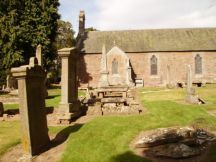 In Borthwick, Midlothian, the practise was so common that the minister writing the First Statistical Account of the parish recalled how 'there are not two farmers in these bounds who bury in this place', whilst in Kirpatrick-Irongray, Kirkcudbrightshire, it was noted that 'there are more funerals here from other parishes than from the parish itself'. This is something that is always worth bearing in mind if you can’t find your ancestor where he or she is supposed to be! 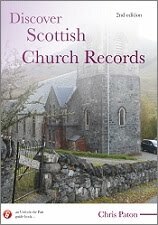 For more on Scottish burial records, and on traditions surrounding death, my books Discover Scottish Church Records (2nd edition) and Down and Out in Scotland,: Researching Ancestral Crisis may help - further details can be found at https://britishgenes.blogspot.com/p/my-books.html.